During the Allied landing operations there was a need for artillery observation planes. Specifically while the operations of Sicily the tpically used Piper L-4 Grasshopper „Cub“ and Stinson L-5, didn't have the range to actually fly to Sicily from Allied bases. Transporting them with transport vessels caused too much time to make them available in the landing zones. 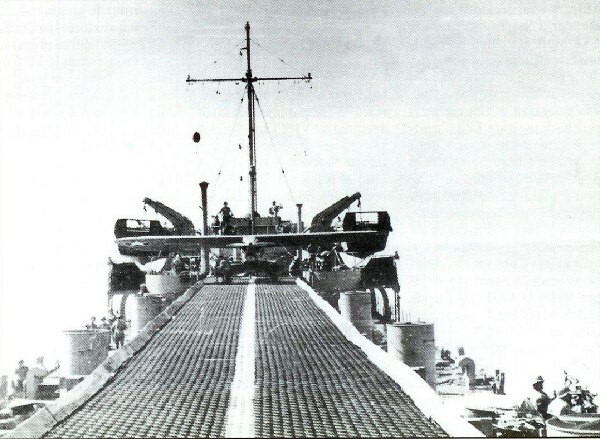 US Army pilot Captain Brenton Devol had the idea to put a narrow flight deck on an LST. 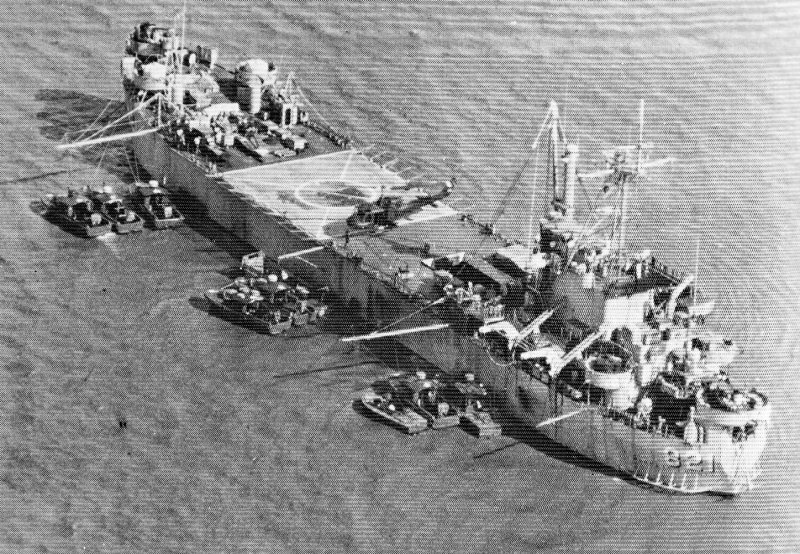 LST-386 was fitted with a flight deck made of timber and pierced metal runway mats with a length of 65,8m and a width 3,6m. The conversion just took 36 hours. 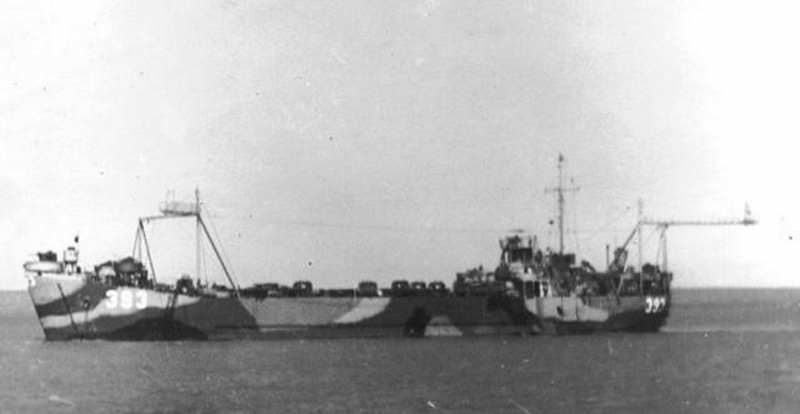 It could carry four planes, plus its normal load of cargo and troops in her tank deck. 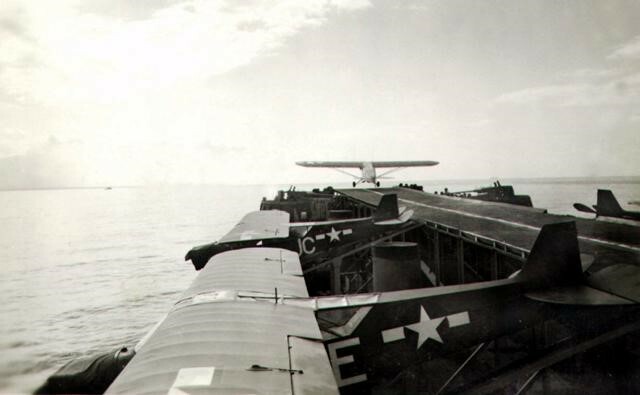 (909)(910)	The first start from LST-386 was on 4th July 1943 with an L-4B. 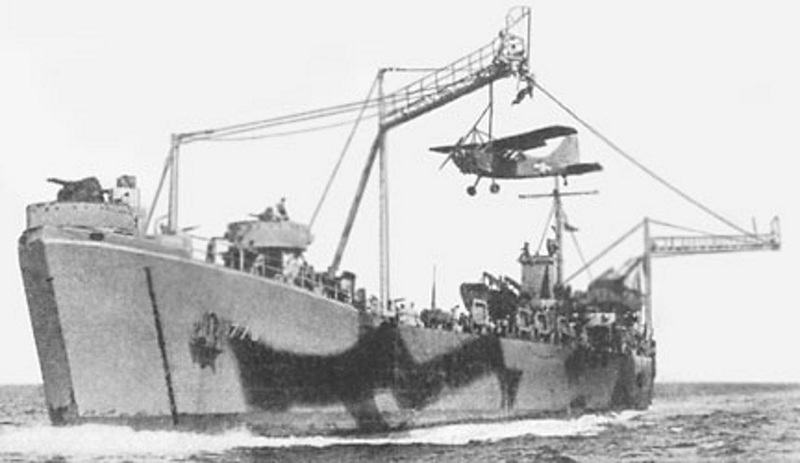 It is reported, that the LST would go into the wind with max speed for starting the L-4. But there is also video material with the planes starting while the LST standing still. For videos see starts in http://www.youtube.com/watch?v=IAR8aRTdxGI, loading in http://www.youtube.com/watch?v=3ZnNCiRAt3 and more in http://www.youtube.com/watch?v=MTwcgy2me8Q, http://www. youtube.com/watch?v=dVcO7lrRO_M. In theory it could be possible to land on the deck, but practically this is very unlikely.(909). 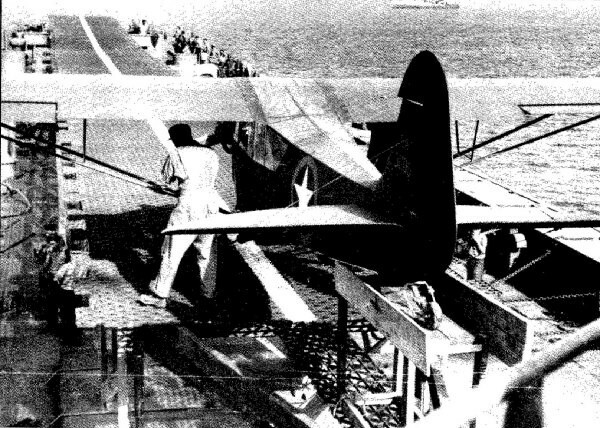 Later LST-carriers were successfully used in operations at the Philippines, Okinawa, and Iwo Jima. More pics see Model LST-906. Another solution was invented by Army Transportation Corps Captain James H Brodie. The method of landing involved catching a hook attached to the plane with a sling which itself was attached to a cable. The video http://www.youtube.com/watch?v=7Wrz20iLAEA shows this. Army service pilot Lt C C Wheeler made the first takeoff in late August 1943, and the first round trip was made on 3 Sept 1943. More pics see Model LST-393 with Brodie system. 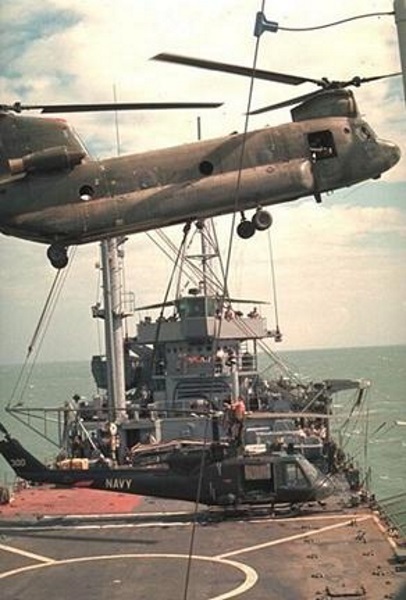 In Vietnam LSTs and their derivatives were used as Helicopter bases. As an example here a picture of the PBR-Tender AG-821. Everything about the background see http://www.warboats.org/stonerbwn/the%20brown%20water%20navy%20in%20vietnam_part%202.htm. An Army CH-47A Chinook heavy-lift helicopter hooking up a damaged UH-1B for repairs. Credits for all original pics shown above: This image or art is in the public domain, since it is created by a person in the military service of a country, where such work results in being public domain.(E.g. US, UK).